Hong Kong A magnificent 42¢ rate First Issue cover by British Packet, via Southampton to Detroit, Michigan, U.S.A. Mailed to Col. I.D. Graham, U.S. Army on June 12, 1863. 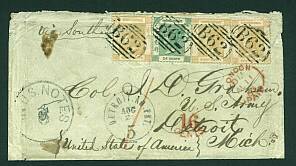 Cover is franked with 1862 8¢ buff (#2, three copies), and 24¢ green (#5), all tied by clean "B62" cancels in black. Front shows London 11 AU 63 transit in red, along with unframed "16 cents" in red, plus scarce Detroit AM pkt Aug 25/5 and "In US Notes" handstamp with manuscript 5 written over 6 rate marking. Reverse bears "Hong Kong JU 12 63" cds in black. Some slight usage creases, etc. This is a mouth-watering first issue showpiece believed to be the earliest and only cover originating from Hong Kong to the United States in that year. Comes with 1994 BPA certificate #41850. Two Huge Holdings Go On Auction Block!